These are often called Autumn Mottled Sedges. 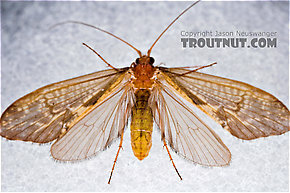 In his tables in Caddisflies, Gary LaFontaine ranks this as the fourth most important genus in the Pacific Northwest, where the main species are Neophylax rickeri and Neophylax splendens, but other species may be important across the country. Swisher and Richards in Selective Trout say that Neophylax fuscus is very important in the Midwest. Neophylax (Autumn Mottled Sedges) Caddisfly Larva View 11 PicturesI haven't really had time to ID this one; I'm just tentatively guessing based on the case that it's in Glossosomatidae. 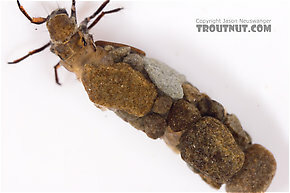 Neophylax (Autumn Mottled Sedges) Caddisfly Adult View 20 PicturesThis large caddisfly looks really neat close-up.